Latin America is facing a huge infrastructure crunch and a growing risk that airport congestion could impede further rapid growth in passenger traffic. Most of Latin America’s major airports are congested and way behind the curve in responding to the growth of the last decade and preparing for the anticipated growth of the next decade. The Latin American airline industry has recorded rapid growth over the last 10 years and has become one of the world’s largest emerging markets. But infrastructure has not expanded nearly as fast and most of the region’s governments are still not responding fast enough, according to Latin American and Caribbean airline association ALTA. ALTA president and Avianca-TACA chairman, Roberto Kriete, told the 2012 ALTA Airline Leaders Forum in Panama in Nov-2012 that over 30% of the flights in the region are already operating from congested airports. The situation will only get worse given the expected growth and lack of new airport projects. Airline executives attending the Forum particularly blasted Colombia and the congestion at Bogota, which is the largest hub for Avianca-TACA. A new international terminal opened in Bogota in Oct-2012 but it is about the same size of the facility it replaced, forcing Avianca to continue using remote parking stands for a large portion of its fleet, including its Airbus A330s. Mr Kriete calls the new terminal “gorgeous, but unfortunately it has the same number of gates as the old airport”. Speaking at the ALTA Forum, IATA CEO Tony Tyler cited Bogota as one of several major airports in the region which is now “bursting at the seams”. He said the international airports in Lima and Mexico City are also operating well above design capacity as well as Buenos Aires’ downtown airport, Aeroparque. Mr Kriete pointed out that there are 94 airport construction projects currently in China while in all of Latin America there are only 16 projects. But in no country in Latin America, and perhaps the world, are infrastructure issues more pronounced than Brazil, where Mr Tyler said 13 airports are now operating above capacity. Mr Kriete said China is often “mentioned together with Brazil” when it comes to countries with huge growth opportunities but Brazil has fallen well behind its fellow BRIC country when it comes to developing airports. While passenger growth in Brazil has slowed this year airport projects are needed in response to the rapid growth in recent years and in preparation for the 2014 FIFA World Cup and 2016 Summer Olympics. ACI President Angela Gittens told the Forum that among airports with over five million annual passengers, Brazil accounted for three of the top 10 and five of the top 20 growth airports in 2011. Campinas, the hub of Brazilian LCC Azul and regional carrier TRIP, was the fastest growing airport in the world in 2011, recording 39% passenger growth. Belo Horizonte grew by 30% and Rio de Janeiro Galeo by 21%. Curitiba and Porto Alegre also made the world’s 20 fastest growing list along with Santiago in Chile. 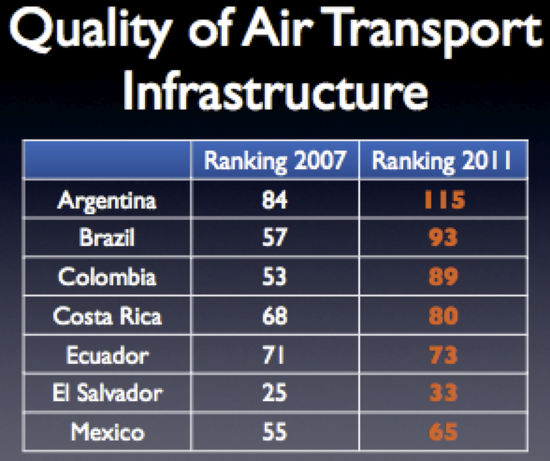 Airports in Latin America overall grew faster than any other region in 2011, according to ACI data. Passenger traffic at Latin American airports was up 8.5% in 2011 while cargo traffic was up 7.6%. IATA joined ALTA, ACI and the Civil Air Navigation Services Organisation (CANSO) in signing a joint declaration at the ALTA Leaders Forum that urges “Latin American and Caribbean Governments to develop air transport infrastructure to adequately meet the needs of the industry, now and in the future”. The joint declaration asks the region’s governments to facilitate the timely development of air transport infrastructure; provide effective economic regulatory oversight to attract investment in air transport infrastructure; apply the revenue generated from aviation for the development of air transport infrastructure; and to refrain from imposing taxes on aviation which are not reinvested into aviation development. ALTA and IATA particularly are concerned with the outcome of three airport privatisation projects in Brazil which concluded in early 2012 with government awarded concessions. At the 2011 ALTA Forum, the two associations initially voiced concerns about the process and structure of the proposed concessions at Sao Paulo Guarulhos, Campinas and Brasilia. One year later the concerns have if anything grown. Mr Kriete told the Forum the privatisation of Brazil’s airports will likely result in higher airport costs for airlines. He warned that airport concessions should not be seen as a “cash cow” with the goal of raising funds in the short-term and ignoring the long-term effects on the industry and economy. ATC infrastructure is another major subject of concern for the Latin American industry. Mr Kriete said that ATC equipment in the region is outdated, airspace is fragmented and inefficient, there is a shortage of controllers and implementation of Performance-Based Navigation (PBN) has been limited. ALTA is now working with IATA in a campaign to increase the implementation of PBN in Latin America. The region’s airlines have invested more than USD60 billion in new aircraft but run the risk the new aircraft cannot be fully or efficiently utilised without a major upgrade to the ATC infrastructure, Mr Kriete warned. 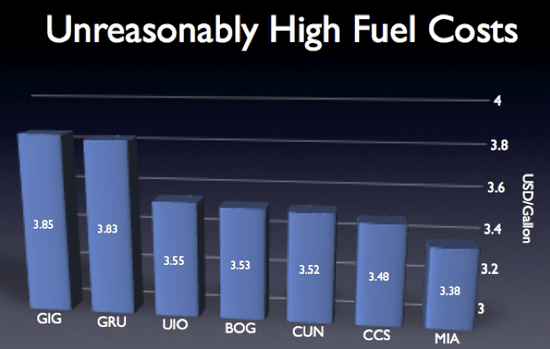 High fuel prices are another major concern for ALTA. Latin American airports have some of the highest fuel prices in the world. Even in some Latin American countries that are oil producers, the prices are significantly higher than in countries that import fuel. Prices in Brazil, an oil-producing country and Latin America’s largest market, are particularly high. Current jet fuel prices at Brazil’s two major international hubs, Sao Paulo Congonhas and Rio de Janeiro Galeao, are over USD3.80 per gallon, according to ALTA. Quito in Ecuador, Bogota in Colombia, Cancun in Mexico and Caracas in Venezuela also currently have jet fuel prices higher than Miami although these countries are all oil producers. Copa CEO Pedro Heilbron said that in some countries such as Colombia there are “very marked differences” in jet fuel prices from airport to airport. TAM CEO Marco Antonio Bologna said fuel prices vary from state to state in Brazil, partly because taxes on fuel range from 12% to 25%. He said there is an effort now to establish a national rate of 12% but he is not hopeful the 27 states will agree to the proposed measure anytime soon. Mr Bologna also complained that it makes no sense for jet fuel prices to be higher in Sao Paulo than Miami. He pointed out that this puts Brazilian carriers at a competitive disadvantage. Latin American carriers are also at a disadvantage because the region’s civil aviation authorities have been slow to adopt common regulations. Mr Kriete said airlines which have successfully consolidated in recent years are unable to reap full benefits because of the fragmented regulatory framework in the region. For example, airline groups are unable to transfer crews between their subsidiaries, limiting efficiency. In Brazil, Mr Bologna said there are outdated regulations governing pilot hours, particularly long-haul flights, making it hard to compete with carriers from other regions. Mr Kriete stressed that coordination between stakeholders needs to improve for the industry to be able to continue growing at a rapid rate. Passenger traffic in Latin America and the Caribbean has increased by 80% over the last 10 years from 95 million to 170 million, according to ALTA. This equates to an annual growth rate of 6.2%, surpassing the average global growth rate during this period of 4.5%. Mr Kriete said the number of routes between Latin America and the rest of the world has increased over the last 10 years by 39% from 687 to 953. “It’s been a golden decade for Latin America,” Mr Kriete said. 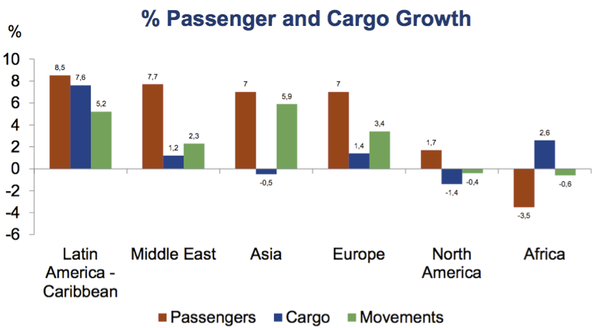 ALTA recorded 7% growth in passenger traffic for the first nine months of 2012. Mr Tyler pointed out that IATA traffic figures for the first nine months of the year show 10% passenger growth in Latin America, making it the second fastest growing region after Middle East. IATA also projects Latin America to be the second most profitable region in 2012 after North America, with an EBIT margin of 2.7% expected for the region’s carriers. “And I can tell you first hand that the optimism present at this meeting is a very welcome break from the economic gloom that we have in Europe where I spend most of my time,” Mr Tyler said. The traffic growth in Latin America is being driven by strong economic growth and rapid expansion of the region’s middle class, which has significantly increased the portion of the population which can afford to fly. Mr Kriete pointed out that the region’s GDP has more than doubled over the last 10 years, from USD2.08 trillion to USD5.6 trillion. Over the same period 115 million people in Latin America and the Caribbean have moved above the poverty line. About 30% of the population in the region is now above the poverty line, compared to about 44% 10 years ago. Over the last 10 years LCCs have also been established in Latin America and have grown quickly in the region’s two largest markets. While the region overall remains relatively less penetrated by LCCs compared to other parts of the world, Mr Kriete pointed out that LCCs now account for over 50% of capacity in Brazil and Mexico. The region’s fleet, meanwhile, has grown from 950 aircraft to over 1,350 aircraft. The average age of aircraft operating in the region has been reduced over the last decade from 14.8 years to 9.7 years, giving Latin America a younger fleet than the US and Europe. Mr Kriete said that 10 years ago the largest airline group in the region was the 27th largest in the world based on annual revenues. The region’s largest airline group, LATAM, is now one of the 12 largest airline groups in the world and has the second highest market cap. “That's something we should all be proud of,” Mr Kriete said. But Mr Kriete warned that there is a risk that the growth and success achieved in the region over the last decade may not be sustainable. Without coordination between civil aviation authorities, airports, airlines and associations, there may not be sufficient infrastructure to handle the growth and costs could creep up. “The last ten years have been a great expansion in our industry. If we wish to maintain the growth of the last decade, we must work together,” Mr Kriete said. Despite years of lobbying, ALTA is concerned that Latin American governments still do not realise the long-term consequences of its actions. “It seems governments haven’t noticed,” Mr Kriete said. Of course complaining about infrastructure and taxes is nothing new. Mr Heilbron pointed out while the region’s airlines have repeatedly been complaining about infrastructure over the last decade they have been recording the highest growth rates in the world. “We had the same infrastructure issues as 10 years ago. What has changed is the airlines,” he said. Airlines have indeed changed in Latin America, becoming more efficient as an unprecedented level of consolidation was pursued. There are now 79 airlines operating in the region, compared to 101 airlines 10 years ago, according to ALTA. But a wave of mergers over the last three years has left six airline groups accounting for about two-thirds of the market. More consolidation and more rapid growth are expected over the next decade. Two ALTA members – Uruguay’s Pluna and Bolivia’s AeroSur – suspended operations earlier this year. “In the blink of an eye you can go out of business,” Mr Heilbron warned. While the infrastructure problems and airport congestion of Latin America are not new, the scale has reached new levels. The region faces a long road and numerous battles before the airports which it really needs are developed and before the region’s crumbling infrastructure can be replaced. Latin America has emerged as a major growth market controlled by a small group of some of the world’s leading airlines. But if the region’s governments do not start responding to the warnings, the full potential of the Latin American aviation industry will not be realised.